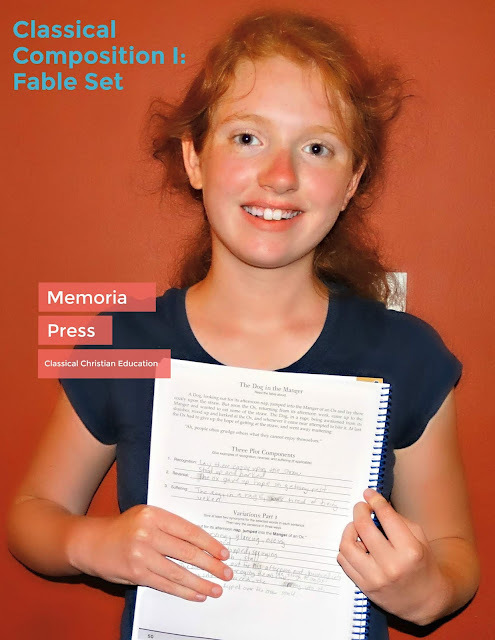 When I think of Classical Christian Education, I think of Memoria Press so I chose the Classical Composition I: Fable Set to review with my daughter. It's important to me that my children have exposure to as much classical education as possible as I believe it's a proven approach to education. How can one go wrong but to be educated similarly as John Milton, William Shakespeare, and Benjamin Franklin all experienced? 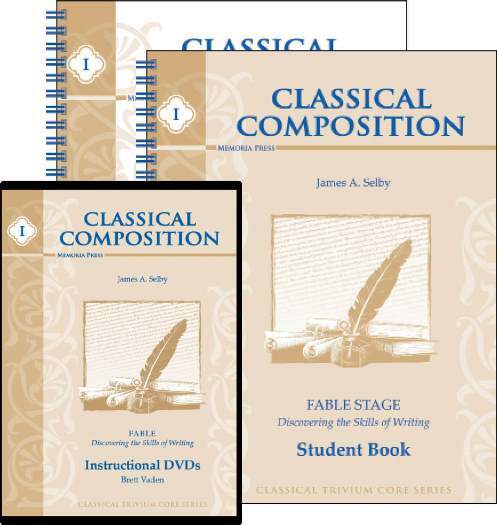 The Classical Composition I: Fable Set is for grades 4-12 and I've decided I will purchase another set for my other daughter. I encourage all my children to read and write as next to play, there is nothing better to spark the imagination. Knowledge is truly gained by reading and I believe, by writing. The set included a Student Book, a Teacher's Guide and Instructional DVDs. If you aren't familiar with Memoria Press, it's been my experience with other items I have reviewed, they include these great instructional DVDs that help to reinforce what is being taught. I love them! The 14 exercises are organized in a simple yet organized way to teach. Apparently, ancient writers invented a way to teach writing known as progymnasmata. It's not only a disciplined approach to communication but fosters the ability to appeal to their audience's heads and hearts. I found from reading the Memoria Press website, Quintilian and Cicero employed the progymnasmata way to teach their students the art of communication. Mr. Jim Selby, of Whitefield Academy, developed the Classical Composition and the students at Whitefield Academy have a 100% qualification rate on the optional essay portion of the ACT and SAT which to me, speaks volumes to the success of this program. I have to admit that one does have to take the time to read the Teacher's Guide and perhaps watch the instructional DVDs for each lesson ahead of time to gain a better understanding of how the course is taught and to be able to effectively guide the student at first. The learning curve was short for both myself and my student. Each lesson is broken down into a fable with sections used to teach the student to think differently and to write something that is truly engaging. Learning from repeating others is a great way to learn how to write. The fable, to include a vocabulary list, provides more student teacher engagement as well as exercises to write synonyms. I have an older student that this would be perfect for as she's very conscious of speaking out loud. Three Plot Components which is tricky if this is the first time you have heard of this. This is where the Teacher's Guide and Instructional DVDs come in handy to further your own knowledge and provide the confidence needed in guiding the student through this section. Variations Part 1, which is the same as above, required assistance from the Teacher's Guide and Instructional DVDs for me to feel confident in teaching it. The Outline is an excellent exercise that will teach the student how to summarize what they read. It provides clarification of the events and the outline provides the student an aid for the Narration exercise. The Narration exercise continues to foster creative thought and thinking when they have to narrate the fable in their own words. Paraphrases I and 2 provides the student with an opportunity to use figures of description to rewrite as well as training the student to view a set of ideas from differing perspectives. Variations Part 2 is the same as Part 1. The Final Draft encourages the student to use their work from Paraphrase 1 or 2 to rewrite their work. Overall, I enjoyed the Memoria Press Classical Composition I: Fable Set due to the ability to really encourage and foster such a way in writing that it will last a life time. The lessons are not like I've seen in any other curriculums which really allows for immense creativity. The set not only teaches students to write creatively but it also adds vocabulary words and the practice of identifying and finding synonyms which I think is critical in the writing process. My student seemed to be really challenged by each lesson and was inspired to excel as each lesson was completed. Follow Memoria Press on Facebook, Twitter, Pinterest, Instagram, Google+ and YouTube. Classical Composition II: Narrative Set.